Due to a miscommunication within the Queens Nails curatorial scheduling pool, some slight changes have been made to the event. The Event posting beneath has all of the correct changes and also the correct flyer has been included. “The Love of All Above” is one part solo art show, one part performance showcase, and one part audience participatory ritual ceremony to show gratitude for the lives we live and the struggles we have endured. John Felix Arnold III, from the days of Babylon Falling and who who brought you Past From the Blast with Japanther last March at Kitsch will be teaming up with a new team of amazing performers and collaborators consisting of Daylight Curfew ( Cassettes Won't Listen, Bisc 1, Grimace, and Turnbull Green), Kool Kid Kreyola, and Him Downstairs, to bring you the newest installment in his long running series ofexhibitions and experiences know as "Unstoppable Tomorrow : The World of Future Antiquity". According to Arnold the series aims to bring you the feeling of "walking inside of a giant graphic novel where Arnold is the documentarian and scribe, and the performers are his musical cohorts, collaborators, and ritual leaders in this post apocalyptic future world." Arnold will be presenting new mixed media painting works, relics, and a new installation piece that will act as an altar and stage for the performers to use as a vehicle to showcase their talents and bring the audience together in one huge ceremonial experience inside of Arnold's realized environment. The performer list is indeed epic and the performers will have CD's and more available. 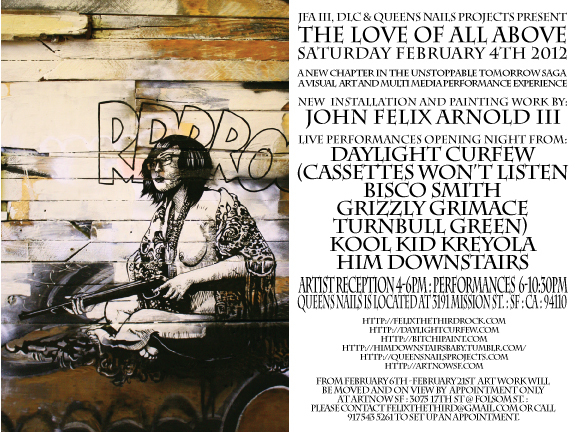 Arnold will also have a limited edition zine for the "Love of All Above" as well. Show Opens Saturday February 4th 2012. 4-6pm Artist reception with complimentary refreshments and h'ordeuvres 6pm-10:30pm Live Performances The Art Work will be moved on February 6th to Art Now SF (3075 17th St, San Francisco, CA, 94110) and will be on view by appointment only until February 21st.